Buoyed by all the excellent performances by the US Men and Women at last week's Rio Olympics, it's time once again to ramble on about some of the brews I've been drinking these days. I'll start with Fort Point's Park Hoppy Wheat. Hops and wheat can be a dangerous mix, sometimes leading to flavors that clash, taste chalky, or just turn out weird. Not here. 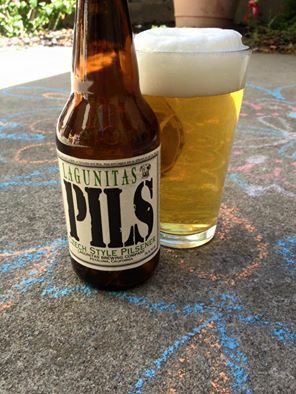 This brew's a fresh, balanced one with lemon citrus flavors and excellent floral aromas. A well crafted beer. Moving along, we come to Coronado Brewing's 20th Anniversary Double IPA. "Each year we brew a huge, hopped-up Imperial IPA for our Anniversary," explains Coronado Brewmaster Ryan Brooks in a press release. "This year's version is bursting with tropical notes from a blend of Citra, Mosaic and Hallertau Blanc hops." I didn't quite get a tropical vibe from this, instead noting intense fruit flavors of plum, apricot, tea, and little pine thrown in for good measure. 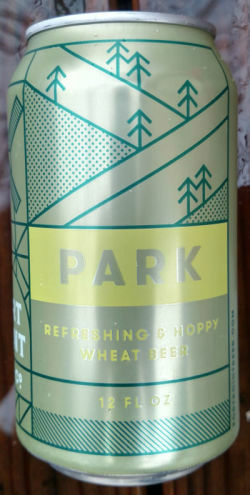 Coupled with a toasty, sturdy malt that added a little sweetness, it's just an excellent composition of unique hop flavors worthy of the 20th Anniversary celebration of a major craft brewery. Finally, I'm a big fan of Horse Tail Dry Hopped California Common from Santa Cruz Mountain Brewing. Who says amber beers like this are boring? Toffee dominates, but flavors of coffee and oak are also in the mix for a wonderfully drinkable complex brew. The dry, study malt malt brings it all together. As I try to find ways to break routine in my running, Sunday I ran the hills of San Jose's Almaden Quicksilver Park for the first time in over a year. There is no flat at Quicksilver. You're either running up a hill or running down one. No two footsteps are the same and your legs are constantly dealing with the force of gravity in all sorts of new directions not normally experienced on flat residential streets. That's why trail running over terrain like Quicksilver is a great way to develop strength and balance. I also noticed imbalances and slight flaws in my running form over the hills I'll be working on over the next few weeks to correct. I'm going to need good hill fitness since I've signed up for the Healdsburg Wine Country Half-Marathon this October 29th and the course has a couple good sized hills on it: A tough 140 foot climb to start the first 0.6 miles of the race and a steep, 160 foot climb between the 8.6 and 9.6 mile marks that will probably make or break the race. So you'll probably see more of me on the Quicksilver trails and doing hill repeats on some of the highway overpasses in and around my hometown of Campbell. Hills are tough taxing and tedious. They also make you a better runner. One of my favorite barbecue and grilling books of all time is Peace, Love, and Barbecue, barbecue champion Mike Mills's folksy tour of world class barbecue shacks and interviews with the legends of barbecue. Mills pried a few recipes from the brains of reluctant pitmasters, but one of the best recipes in the book was provided willingly by food writer and culinary consultant Elizabeth Karmel. It's her Beer-Brined Smoked Catfish and it's a great recipe for two reasons: It's really easy to make and the catfish tastes great. You make a simple brine, soak the catfish overnight in the brine and smoke them the next day. Here's the recipe for the brine. I smoked the fish on my Weber Spirit E-310 Grill using soaked pecan wood chips with a smoker box. Any mild wood like cherry, apple, alder, or peach would likely work. I'd steer clear of stronger woods like hickory, oak, or mesquite that might over power the fish. Actually, I'd steer clear of mesquite, period. But I digress. If I have any critique of Ms. Karmel's recipe, it's a tad too salty for my taste. You might want to cut back the salt in the brine to 3/4 or even 1/2 cup if you prefer less salt. Yes, fellow beer geeks, I use Budweiser in the brine. I suppose if you want to use a lager from your favorite local brewery, go right ahead. My guess is that you won't be able to tell the difference. A light amber or Vienna Lager like Sam Adams might work here, but might thought is that dark or hoppy beer might start to overpower the delicate catfish. Enjoy and be careful. Ms. Karmel's Beer Brined Smoked Catfish is pretty addictive. I started this blog naively enough. I wanted to write about beer and running, nothing more, nothing less. I really didn’t know where it would take me and figured I might even get bored with it after six months and quit. But in a surprisingly short time, I started meeting all sorts of interesting people and learning all sorts of new things writing away in my little corner of the Internet. While this was personally rewarding, the content noticeably improved and more people started coming over, so presumably others were getting something out of it too. After more than seven years of that, the blog certainly evolved. I don’t write much about running as I used to, since there's nothing more tiresome than a runner continually talking about their running. The writing on beer became more technical, the more I learned about the subject. No longer do I see any urgency in breathlessly writing about each new beer consumed or brewpub visited. I’ve spoken to quite a lot of brewers and others in the beer industry, building an increasing reservoir of beer knowledge to tap into for each story. Learning and writing about how beer is made, where it comes from, and the cultural and economic forces that shape it, is what really drives this blog. In many ways, beer is a specialized form of food. So with that in mind, I’m adding a new dimension to this blog. This summer, I bought a Weber Spirit E-310 gas grill and reignited my love of grilling. There's something about careful management of the raging fire activating the chemical reactions within the food on to create the distinctive flavors we all love that appeals to the techie scientist in me. Of course, there's an art and intuition required for those grilled flavors to come alive which simply cannot be reduced to a set of rules and formulas. It's this art and science of grilling I'll be exploring through new recipes, techniques and discussions I'll be sharing here. Grilling and beer are pretty complimentary activities, so I don’t think this is too dramatic of a shift. Since I’m still doing the running thing, don’t expect many stories about big hamburgers or barbecuing huge cuts of meat. I’ll make no claims you'll be reading about super-duper healthy grilling here, but expect more about fish, chicken, vegetables than you’ll find in other grilling sites out there. I just hope you enjoy reading about what I'm up to at the grill and will literally savor the results. So moving forward, expect to see a post on grilling once or twice a month, starting tomorrow. Not sure where it will all lead to, but then that’s all part of the fun. When you think of hops in America, it's likely you don't think of California. You probably think of the Pacific Northwest since the states of Washington, Oregon, and Idaho account for 95% of our nations hop acreage. California's hop acreage is estimated at a minuscule 130 acres, but that figure increased 53% over last year a for a number of reasons we'll get to shortly, and figures to grow in similarly dramatic fashion in the coming years. 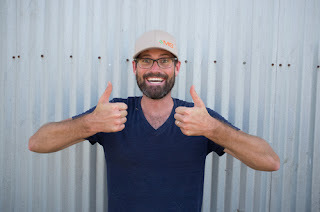 To discuss the small, but fast growing California hop industry and what it means for beer in California, I spoke with Landon Friend, a hop farmer, partner in Binary Hops and organizer of the California Hops Grower Association. Below is an edited version of that interview and in a couple places, I've added background information on hops in italics I thought was needed to make Landon's answers more understandable. What does the California Hop Grower Association do? It’s changed from its inception two years ago. At first, we were mostly sharing battle scars, talking about what was working, what wasn’t working. What’s emerged is that we realized we had a lot of shared resources we could draw upon, shared knowledge, shared equipment that we could all use. Right now, there are about 15 hop growers statewide but that number is growing. Every month, I get at least a couple calls or e-mails from new growers or new breweries looking for resources. Since we’ve grown from farms ranging as far north as Chico and as far south as San Diego, it’s getting harder to share equipment. It’s rather problematical getting a harvester from San Diego to the Sacramento area or further north. These days, were reaching out more to brewers and consumers and formed a quasi-partnership with the California Craft Brewers Association, featuring our hops in their annual beer festival in Sacramento held in September. A second mission is evolving in that we are working with universities like UC-Davis, and research organizations like USA Hops, and discussing things like what fertilizers work, what pesticides don’t work, and what equipment is best to use. How did you get into hop farming? 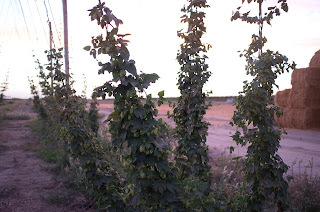 I come from a farming family from the Tulare region, we had an area of our farm that we weren’t doing anything with and a homebrewing friend of mine thought we should try to grow hops there. At first, we went for 10 plants, and then a third of an acre, and now it’s about a ½ acre. On our family farm in the central valley, we were growing crops like hay and alfalfa. We’re transitioning to higher value crops like tomatoes and carrots, and hops is a part of that. It’s also part of effort to get getting better with our water usage. What challenges face California hop growers? Chiefly, it’s having the equipment to cheaply harvest. For a small start-up operation, the issue is how do you get the equipment so you don’t have to employ a huge labor force to handle it, We just bought a little mechanical mobile harvester which costs between $10,000-$15,000 that I can also rent out to cover the costs, but it’s still a big expense for any farm. Another challenge for growers is find the right hop variety for the amount of daylight available. I have about a half hour less daylight than growers in the Sacramento area, so have to figure out what variety will be grow in those conditions. Everyone in California is dealing with less daylight than they have in the Pacific Northwest. Do California hops have a unique flavor or characteristic that aren’t captured in other regions? You’ve got a superior product here compared to the Pacific Northwest. We’re not processing our hops as much here as they are. If you can get hops out of the field with less mechanical processing, you’re going to get a better product. Cascade hops do really well in California. The have Cluster in their lineage which was originally grown here in California. It’s never going to be really possible to compete directly with the Yakima growers so we’re trying to find a California terroir. So were growing things like Neomexicanus hops and they have been doing well. A publicly available hop variety Washington State University has put out called Cashmere has done excellent in California. The first year I saw one grow, it was almost a mature plant, I was shocked. The Hopmeister Farm in California is working on a couple of proprietary varietals, one’s called Gargoyle, that are doing well. Any beers or breweries you can name that use California hops? Breweries are definitely interested in California hops because when they can say “the hops are local”, that generates excitement. I’ve supplied to a couple different breweries in San Luis Obispo, Libertine Brewing and Dunbar Brewing. Hop growers around Sacramento have supplied Track 7 and Lagunitas. Ruhstaller brews with California hops. According to acreage statistics from USA Hops, the state of California increased hop acreage from 85 to 130 acres in 2016, a 53% increase over 2015. Where do you see California’s hop acreage going in 2017? I can see that number growing 10-20%. It’s real easy to find someone growing hops in their backyard. I see that number being a little off, I see a lot of people doing more. I think beer is going to look like the wine industry. If you get a Syrah, it’s taste will differ from the region it’s grown because the soil is different, the climate is different, the daylight is different. I see that happening with beer in California. I've hit the running "reset" button. Many coaches stress routine in their training programs, but I was falling into a "If today is Monday, I must be running ___" kind of rut. It was getting boring and some days were seemingly set on autopilot. Other days, I was trying to fill my "round hole" of a workout with the "square peg" of fitness reality. And after recently reading Becky Wade's book "Run the World", I was struck by how so many of the world's great runners can be quite spontaneous, running workouts they just made up or down paths they've never been before. So ramping up for a fall half-marathon, I'll be making a point to run through neighborhoods I've run through before, or down new trails. I'll be mixing in different paces at varying distances, unlike the old days where I'd do tempo runs at a fixed length as a weekly staple. There'll be a method to the madness, but I'll make sure there's a little madness to the method. It isn't just being different from difference sake. Changing things up develops a certain focus, awareness and adaptability which can come in handy on race day. I'm not sure where this spontaneous approach is going to take me, but that's part of the beauty of it.